I wasn’t the sort of child who went dribbly-mouthed and frantically bothersome outside a sweet shop. Stand me in front of a bookshop, however, and there was no peace for anyone until I’d emptied my purse into its till. I’m still rather like that now, particularly where second-hand bookshops are concerned. And, for that, I credit one particular place: Unit 72, Birkenhead Market. 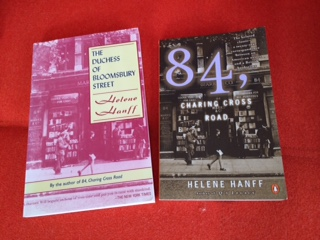 It’s been more than two decades since I went there – in fact, I don’t suppose it even exists anymore – but I thought of it the other day when I reread Helene Hanff’s wonderful 84, Charing Cross Road. Hanff, a martini-loving, cigarette-smoking, New York dweller, was a playwright and screenwriter who found by far her greatest success in later life when she published a book of her correspondence with a London bookshop, Marks & Co. The shop specialised in acquiring second-hand books, particularly from the sales and clearances that increased so rapidly in number after the Second World War (WWII) as the owners of many of the UK’s largest houses admitted financial defeat and sold off their possessions along with their bricks and mortar. One person’s loss was another’s gain, and Hanff, whose formal education did not extend beyond high school, was a lifelong self-educator with a particular passion for English literature. Although even some of the more obscure titles she ordered by post from Marks & Co could doubtless have been obtained in New York, she would buy her books from nowhere else: “The books arrived safely, the Stevenson is so fine it embarrasses my orange-crate bookshelves…I never knew a book could be such a joy to the touch.” Through her correspondence first with Frank Doel, the chief buyer for the shop, and then with other staff members too, she became closely involved with their lives. For several years after WWII she sent them food parcels (“My little ones…were in Heaven – with the raisins and egg I was actually able to make them a cake!”) and they reciprocated with a beautiful hand-made Irish linen tablecloth and repeated invitations to please visit them in London. There was little Hanff wanted more than to visit the “London of English literature” but she was stymied repeatedly by financial constraints, poor health and also, one senses, a fear of travel. For more than two decades her explorations happened solely through the pages of the books she ordered from Marks & Co. When Frank Doel died suddenly following a ruptured appendix, Hanff was motivated to ask his widow, Nora, if she could publish a volume of their correspondence. And so 84, Charing Cross Road, the book, was born. Published by Andre Deutsch, it gave her both plaudits and money. At long last one of the barriers preventing her from crossing the Atlantic was blown away. And so, with a case of newly purchased clothes, including a dress – “silk, chic and expensive…intended to cover large evenings” – and a growing sense of trepidation that had kept her from sleeping the night before, she found herself on a plane. The result of her ensuing six week stay in London is recorded in her book The Duchess of Bloomsbury Street (currently out of print in the UK but due to be rereleased in July 2016). I was living in London when I first read this book – living in London, slightly jaded by its dirt, its cost of living, its crowds and the quietly terrifying sense of threat that pervaded the place after 9/11. The Duchess of Bloomsbury Street seized me by the scruff of my surprised neck and reminded me of all that was good about London and how much I too had once wanted to be there. Mine was the crowded, crawling streets of the Medieval city; the flash and dangerous opulence of Henry VIII’s time; the oh-so desirable salons of the Bloomsbury Set; the West London streets set with large white houses with pillared entrances and chequerboard steps; and St Pauls-the-Phoenix. Hers was Bloomsbury, Russell Square, Regents Park, St Pauls, Westminster Cathedral and Shakespeare Shakespeare Shakespeare. More than that, though, she opened her arms and her heart to the modern day city, and it to her. I don’t think she ever made a repeat visit but I’m not sure she needed to. I don’t live in London anymore but if I need reminding of what I did come to love about the city I only have to read her books. Her places were not necessarily mine but her words fill me with the sense of how books open doors figuratively and, sometimes, literally. Unit 72, Birkenhead Market once did that for me, too. It’s where I joined the Chalet School, tried out a US Californian high school, travelled the world with Gerald Durrell, set my cap at becoming a Yorkshire vet, stomped across Egdon Heath and wept over the fate of those luckless last few in “On the Beach”. 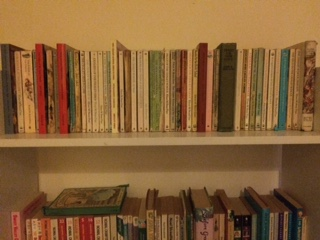 I still have almost all of the books I bought from Unit 72 – only those that I knew I’d never want to read again or actually fell apart have been, reluctantly, retired – and I still read most of them, now and then. Some people (my husband!) say life is too short and there are too many good books to read one more than once. It’s a valid point but I’m with Helene Hanff here: like clothes that I wear many, many times, I reread my books again and again. Why would I not when they take me to so many places I’ll never visit any other way? I love 84, Charing Cross Road, but hadn’t heard of The Duchess of Bloomsbury – sounds intriguing. Really!? I would love that. Thank you Helen. Second hand bookshops are just the BEST!